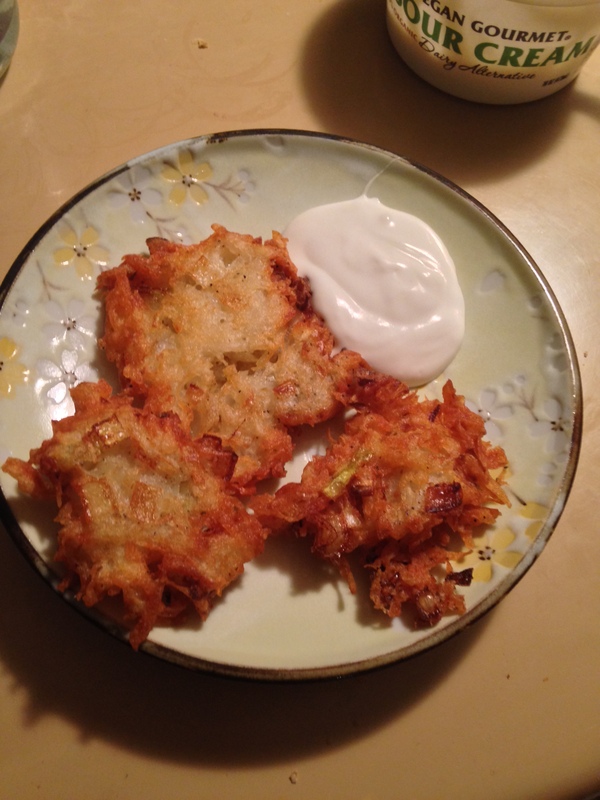 My family has a tradition for the first night of Hanukkah to make latkes. Unfortunately, the recipe we’ve always used calls for eggs. This is the first time I experimented with egg replacer, and it actually turned out better than my mom’s she made that were not vegan. In a large bowl, fill with freezing cold water and ice. Grate potatoes and put the potatoes into the ice bath while you prepare the rest of the ingredients. This prevents discoloration of the potatoes and reduces the sogginess. Chop onion and whisk together the egg replacer and warm water in a small bowl. Drain the potatoes in a strainer. Be sure to get all the ice out. In a kitchen/ tea towel, place the drained potatoes in the middle, and squeeze out any excess moisture. Place into a large mixing bowl, mix in all ingredients except oil. Cover a frying pan with about an inch of oil. Heat on high until a piece of potato bubbles and sizzles immediately upon placing in the oil. Place a wooden spoonful of the potato mixture in the oil. With the back of the spoon, press down to flatten in the oil. Use a slotted spoon to flip them after they have browned on the bottom side. Keep in the oil until both sides are browned. Place onto a plate with paper towels to drain. 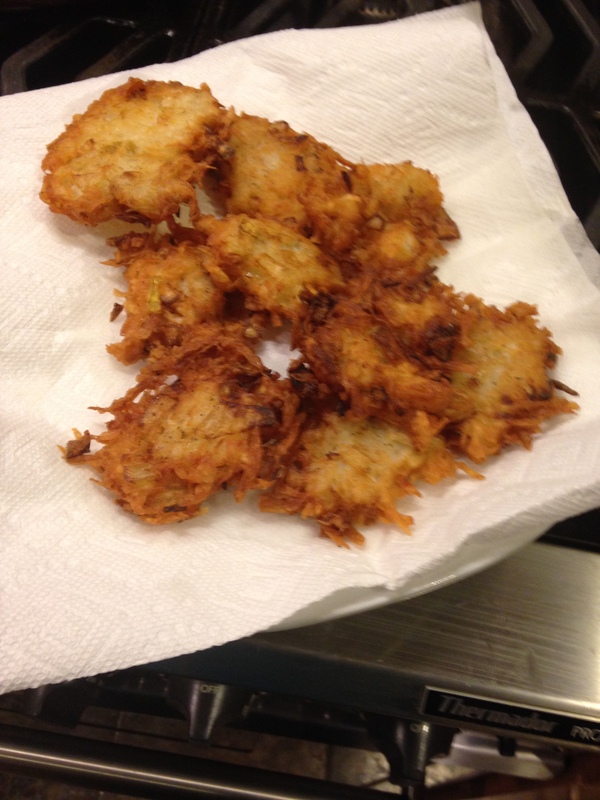 Continue to fry until you have used up the batter. You will probably need to turn down the heat a bit to allow them to cook a bit more slowly at some point. Enjoy! Have a happy holiday!